Shield and nourish skin with the HydroPeptide Solar Defense Non-Tinted SPF 50; a scent-free, clear sunscreen offering maximum protection against UVA, UVB and Infrared damage. Enriched with free-radical fighting antioxidants and ultra-hydrating Hyaluronic Acid, the lightweight formula infuses skin with moisture while helping to combat signs of premature ageing. Skin feels soft and supple with a sheer matte texture for a natural looking finish. Free from gluten, parabens, phthalates and sulfates. Not tested on animals. 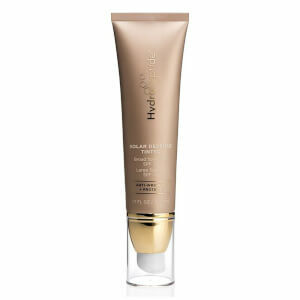 Apply sufficient amount of product to cover entire face and massage until evenly absorbed. May also be applied to neck and décolleté. Reapply every two hours and after swimming, excessive perspiring or after towel drying. Active Ingredients: Titanium Dioxide (3%), Zinc Oxide (7%) Inactive Ingredients: 1,2-Hexanediol, Allantoin, Alumina, Biotin, Butylene Glycol, C12-15 Alkyl Benzoate, Calendula Officinalis Flower Extract, Camellia Oleifera Leaf Extract, Caprylyl Glycol, Caprylyl Methicone, Cetyl Alcohol, Chamomilla Recutita (Matricaria) Flower Extract, Citric Acid, Cucumis Sativus (Cucumber) Fruit Extract, Cyclomethicone, Cyclopentasiloxane, Dimethicone, Disodium Edta, Ethylhexyl Palmitate, Euterpe Oleracea Fruit Extract, Glycerin, Glyceryl Caprylate, Glyceryl Stearate, Glyceryl Undecylenate, Hydrolyzed Yeast Protein, Hydroxyethyl Acrylate/Sodium Acryloyldimethyl Taurate Copolymer, Kaempferia Galanga Root Extract, Lauryl Peg-9 Polydimethylsiloxyethyl Dimethicone, Niacinamide, Panthenol, Peg-100 Stearate, Pentylene Glycol, Polyhydroxystearic Acid, Polysorbate 60, Propanediol, Propylene Glycol, Pyridoxine Hcl, Saccharomyces Cerevisiae Extract, Sodium Citrate, Sodium Hyaluronate, Sodium Pca, Thermus Thermophilus Ferment, Triethoxycaprylylsilane , Triethoxysilylethyl Polydimethylsiloxyethyl Hexyl Dimethicone, Water, Xanthan Gum. This stuff is wonderful. Doesn’t sting my face like other products have done in the past. It’s a bit pricey but worth it.